Fuel economy and a flexible floor plan are this Honda's hallmarks. Those who like their small cars big on the inside will find the Fit a good fit. Adult-sized room front and rear plus cargo space is rare in a subcompact. Rare, too, are trips to the gas station in the Fit, with an EPA estimated 33 miles per gallon in the city, and 38 on the highway. So much space, a worthy tradeoff for minor problems. The space that the car offers, while still being a relatively small and fuel efficient car, is amazing!! I have no problem transporting bicycles, small kayaks, furniture, work equipment, and of course humans. The size, shape, and space is a huge plus for me. It is also easy to park. I have had a few problems over the years, including one with the key and the ignition (the ignition had to be replaced and a new key was issued, but then the same key didn't work for the door and the ignition). The latch that opens the hatchback also sticks now, and has to be manually pushed back into place before the hatchback can be closed. I have also had a few problems with the exhaust pipe and muffler staying put, but it is an older car that is experienced northeast winters so some wear and tear underneath is expected! Overall very pleased with my fitty cent:). Honda fit makes you feel secure. I have a Honda fit 2007, we bought it this year. I am the second owner, I used it when I picked up my two daughters. I love my car though it is not brand new but it feels like it is. It does not give us some headache, I mean it does not have any problems like engine, it fits my daughters well. It is small but cute. They really love riding my car. Definitely I will love promoting a Honda fit. It is my first car and I didn't have any problem with it when my husband taught me how to drive. I also didn't have any problem finding a parking space because it fits. Small but definitely so reliable. So far I have no problem about it. Small, big comfort. Fit is great, short front, not wide & not long, just right. 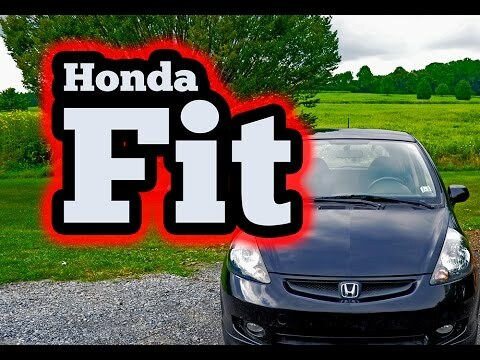 For the most part I love my fit sport, but the front bumper is awful, it is too low and catches on the wheel stops in parking places, it catches on the curbs and not just a little bit, the bumper is almost pulled off depending on the wheel stop or curb. I have seriously considered have the front bumper changed out. Now for the things I love, the front end is short making for easy turning and fitting into tight spots. For a fairly small vehicle it has a lot of space. I have ridden in all seats of the fit and everyone of them is really comfortable. ON CERTAIN PASSENGER VEHICLES AND MOTORCYCLES, THE OWNER'S MANUALS CONTAIN INCORRECT CONTACT INFORMATION FOR THE NATIONAL HIGHWAY TRAFFIC SAFETY ADMINISTRATION'S (NHTSA) VEHICLE SAFETY HOTLINE. THE LANGUAGE IN THE OWNER'S MANUALS IS NOT IN ACCORDANCE WITH THE CURRENT MANDATORY REQUIREMENTS. HONDA WILL SEND A POSTCARD TO DEALERS AND OWNERS WITH THE CORRECT NHTSA VEHICLE SAFETY HOTLINE INFORMATION AND WITH INSTRUCTIONS TO INSERT THE CARD INTO THE "REPORTING SAFETY DEFECTS" SECTION OF THE OWNER'S MANUAL. THE RECALL IS EXPECTED TO BEGIN IN EARLY AUGUST 2006. OWNERS MAY CONTACT HONDA AT 1-800-999-1009, ACURA AT 1-800-382-2238 OR HONDA MOTORCYCLES AT 1-866-784-1870. Honda (American Honda Motor Co.) is recalling certain 2003-2012 Honda Accord and Pilot, 2010 Accord Crosstour, 2001-2011 Civic, 2002-2011 CR-V, 2003-2004, 2006-2008 and 2011 Element, 2007 and 2009-2013 Fit, 2010-2012 Insight, 2002-2004 Odyssey, and 2012 Ridgeline vehicles. The front passenger air bag may have been installed incorrectly during replacement. An incorrectly installed air bag may deploy improperly in the event of a crash, increasing the risk of injury. Honda will notify owners, and dealers will inspect and, if necessary, replace the passenger frontal air bag module assembly, free of charge. The recall is expected to begin June 1, 2018. Owners may contact Honda customer service at 1-888-234-2138. Honda's numbers for this recall are K1P, and M1O. Honda (American Honda Motor Co.) is recalling specific 2003 Acura 3.2CL, 2013-2016 ILX, 2013-2014 ILX Hybrid, 2003-2006 MDX, 2007-2016 RDX, 2002-2003 3.2TL, 2004-2006, and 2009-2014 TL, 2010-2013 ZDX and 2001-2007 and 2009 Honda Accord, 2001-2005 Civic, 2003-2005 Civic Hybrid, 2001-2005 Civic GX NGV, 2002-2007 and 2010-2011 CR-V, 2003-2011 Element, 2007 Fit, 2002-2004 Odyssey, 2003-2008 Pilot, and 2006-2014 Ridgeline vehicles. The affected vehicles received a replacement driver air bag inflator as part of a previous Takata inflator recall remedy or a replacement driver air bag module containing the same inflator type as a service part. Due to a manufacturing error, in the event of a crash necessitating deployment of the driver frontal air bag, these inflators may explode. Honda will notify owners, and dealers will replace the driver's air bag inflator with an alternate inflator, free of charge. Owners will be notified of the recall beginning on April 17, 2019, however, dealers are ready to begin repairs immediately. Honda owners may contact customer service at 1-888-234-2138. Honda's number for this recall is O41. Acura owners may contact customer service at 1-888-234-2138. Acura's number for this recall is U40. Honda will notify owners, and dealers will replace the front passenger air bag inflator, free of charge. The manufacturer has not yet provided a notification schedule. Owners may contact Honda customer service at 1-888-234-2138. Honda's numbers for this recall are KD9 and KE0. Honda will notify owners in July 2013 and will instruct owners to take their vehicles to dealers to have a free inspection conducted. If the switch is damaged, it will be replaced free of charge. If the switch is not damaged, the owner will be instructed to await a second notification that will instruct them to return to the dealer to have a replacement switch installed free of charge. Honda anticipates it will have sufficient parts inventory to notify owners of vehicles with undamaged switches to return to dealers for replacement switches in Fall 2013. Owners may contact Honda at 1-800-999-1009. Honda's recall number is JA6.